First up is one that’s most readily recognizable by its flowers: tansy (Tanacetum vulgare). 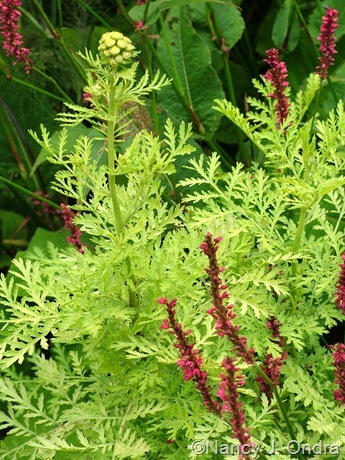 This selection, though, is worth growing more for its lovely, lacy leaves. 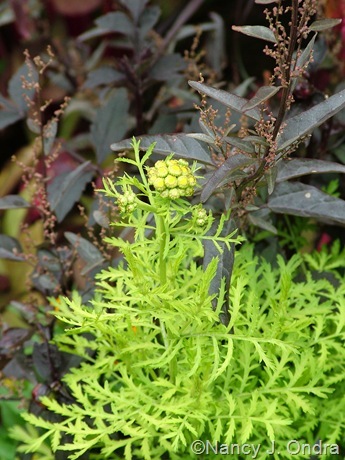 From sprouting in spring all the way through fall, ‘Isla Gold’ tansy’s bright yellow to chartreusy foliage complements all kinds of combinations. 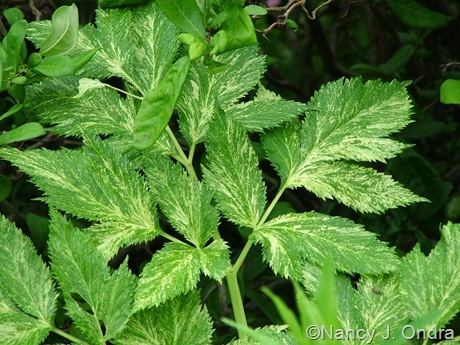 It’s subtle but pretty with the sweetly scented, creamy plumes of another herb, variegated meadowsweet (Filipendula ulmaria ‘Variegata’). 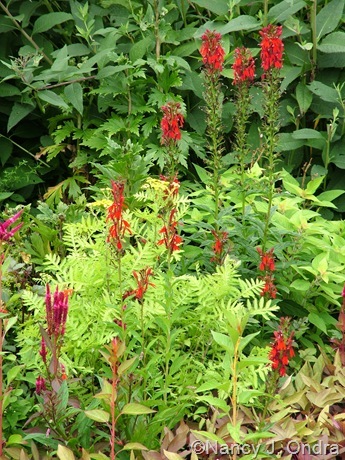 …and cardinal flower (Lobelia cardinalis). ‘Isla Gold’ also does an excellent job covering the stems of summer-blooming bulbs, such as drumstick chives (Allium sphaerocephalon). It’s a great color and textural accent for foliage-based combinations, too. Red orach (Atriplex hortensis ‘Rubra’) is just one wonderful companion. By bloom time, ‘Isla Gold’ is usually about 2 feet tall. I normally cut off the summer flowers to prevent self-sowing – they don’t add much to the show anyway – but I sometimes leave the late-season blooms for a bit of extra fall color. Beneficial insects love them, too. 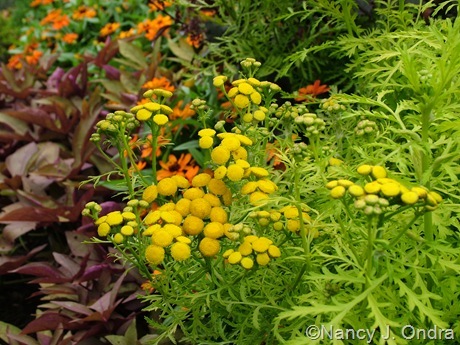 Common tansy is one of those herbs you plant only once, because it can be quite a spreader. I’ve heard other gardeners say that ‘Isla Gold’ spreads too, but it’s been very well behaved here. I’ve had my original clump in one spot for six years and finally gave up on waiting for it to expand enough for some good-sized divisions, so I bought another clump last spring. 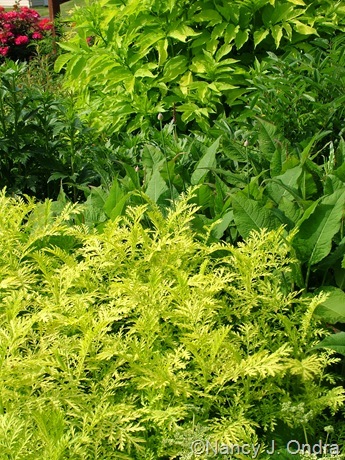 ‘Isla Gold’ grows best in full sun to partial shade and can adapt to a range of soil conditions. It’s reportedly hardy in Zones 3 to 9. On-line sources include Digging Dog, Forestfarm, and Plant Delights. 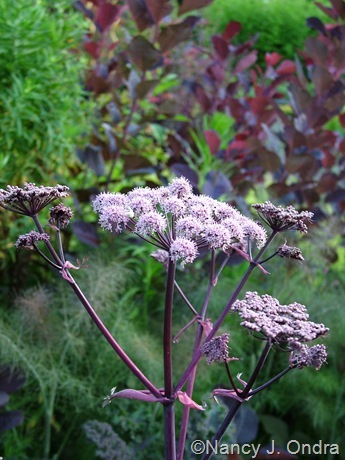 Common angelica (Angelica archangelica) is excellent for height and form, reaching about 6 feet tall in bloom, with rounded umbels in early summer. 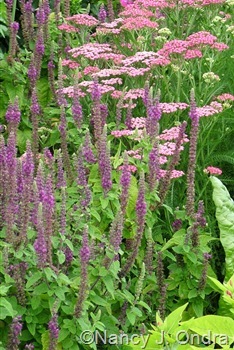 (Below, it’s to the right of Stachys officinalis ‘Rosea’.) 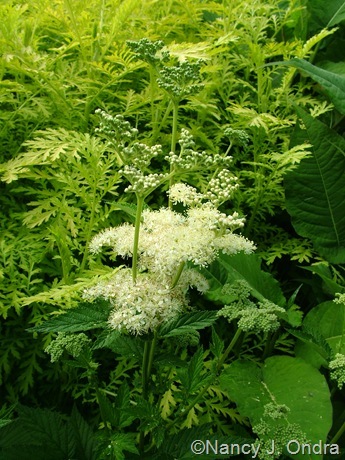 It takes 2 or 3 years to reach flowering size, however, and the broad, leafy green clumps hog a lot of space without adding much to the garden during that time. After bloom, it self-sowed abundantly for me but in all the wrong places, and the seedlings were touchy about being moved. …and then in bloom too. But sadly, it didn’t self-sow at all. 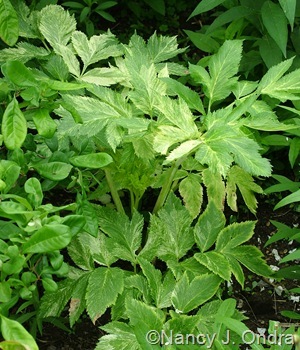 …but forgot that that the seed packet said it was a tender perennial. That may explain why it didn’t return to flower the next year. My most recent experiment brings us to this post’s neat plant: A. archangelica ‘Corinne Tremaine’. 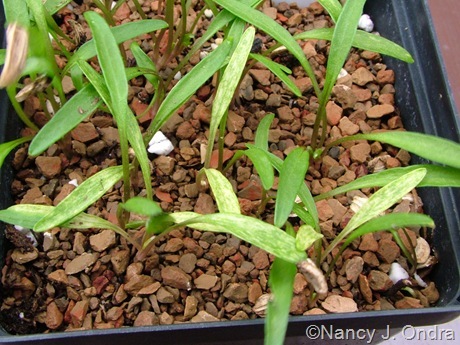 Its special trait is variegated foliage, which is evident even at the seedling stage as a white stippling that alarmingly resembles spider mite damage. 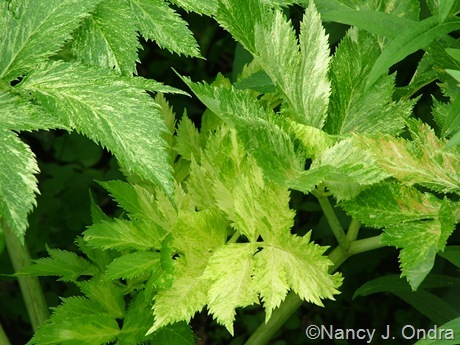 …then the variegation becomes more evident as the leaves age. Overall, ‘Corinne Tremaine’ was about half the size of the species, reaching about 18 inches wide and to 3 feet tall in bloom. ‘Corinne Tremaine’ grew well in both full sun and morning-only sun with rich, moist but well-drained soil. The flowers are nice, but from now on, I plan to cut off the bloom stalks to maintain the lush clumps of brightly variegated leaves. Seeds of ‘Corinne Tremaine’ are available from Plant World Seeds (you can get ‘Ebony’ there too). A few U.S. nurseries that don’t do mail-order offer plants for sale, so you may want to try a Google search to see if you can find a local source. I haven’t found any specific zone ratings for this strain, but the species is usually rated for Zones 4 to 9. Herb gardeners typically grow germanders (Teucrium) in the form of wall germander (T. chamaedrys), with small, glossy, deep green leaves, or bush or shrubby germander (T. fruticans), with silver-haired foliage. Both of these also have tiny pink or light blue flowers, but the plants are often clipped into small hedges or into geometric shapes, removing the flower buds in the process. Caucasian germander (T. hircanicum, also sold as T. hyrcanicum) has nice foliage too: it’s a soft-furry green, deeply veined, and aromatic on dusky purple stems. And like other germanders, the plants respond to regular trimming by becoming very dense and busy. But that’s beside the point, because the best part of this plant is the rich purple flower spikes. They usually color up by the end of May here and continue flowering through the summer months into early fall, at least. Above is an early June shot; below is the same grouping in late July. 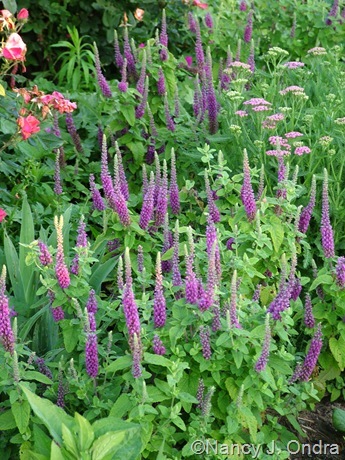 The overall height is about 2 feet, with an equal width, and the general effect is like that of a salvia or a veronica. As the main spikes elongate, shorter side spikes appear. I’ve tried shearing the plants in late July to get a fresh show in fall, but the resulting very short spikes aren’t very showy. I’ve also tried snipping off the main spikes as they finish to get a fresher look from the side spikes, but they are so abundant that the process is very tedious. I’ve decided that the mix of old and new bloom spikes isn’t bad, and the overall very spiky look gives the plants a lot of personality into fall – and into winter, too. The one disadvantage of leaving the mature spikes is that, like most perennials that are easy to grow from seed, Caucasian germander also self-sows freely. I often find seedlings in my bark-mulched paths and in the loose gravel areas too, and they look rather weedy when they’re young: very much like purple dead nettle (Lamium purpureum), another mint-family member that’s a real pest around here. So anymore, I cut the plants back to 2 or 3 inches in late October, which eliminates the winter presence but minimizes self-sowing. Caucasian germander has grown all right here with morning sun only but is denser and much more free-flowering in full sun. It puts up with my often-damp soil but is supposed to be very drought-tolerant, and heat-tolerant as well. Caucasian germander is reportedly hardy in Zones 5 or 6 to 9. Companion Plants sells plants of the species, as does Lazy S’s Farm; Plant World Seeds and Gardens North have seeds. Plants of a seed strain called ‘Purple Tails’ are available from Digging Dog and Forestfarm; Hazzard’s Wholesale Seeds lists the seeds. Not having grown them side by side, I can’t say how – or if – ‘Purple Tails’ differs from the species. I planted the common tansy last spring and haven’t gotten to see it spread yet although I have the space for it! I like the germander. I really like the combination of it and the achillea! The common tansy really is pretty in bloom, so I think you’ll enjoy having it around, Dave. You’ll probably notice it spreading by next year, but since you have the room for it, that shouldn’t be a problem. It’s a good partner for other spreaders, such as monardas. Great to hear a report from another blogger, Ks. Veronicas look nice here for a few weeks in June, but the germander’s heat tolerance and much longer bloom period beats them by a mile. 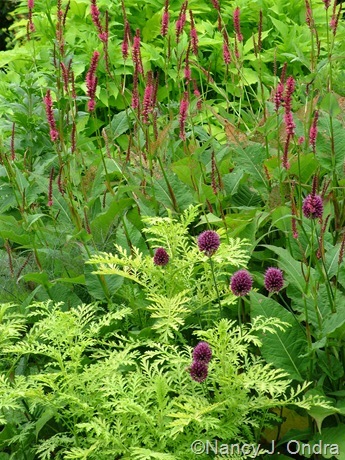 I´m not in herbs at all, but yours look very lovely – especially the `Ebony´ angelica. I’ll bet you have a number of herbs in your garden, Susie, even if you don’t think of them that way. I’ve been having great fun this winter re-learning about the herbal properties of my plants and realizing that I’m already growing most of the pretty herbs as ornamentals. Most of what I still need to add are the “weedier” medicinal and tonic plants, like burdock and motherwort. Really informative post and some lovely combinations. I’d never come across Teucrium hircanicum, but really love the look of it. Thanks, Janet. 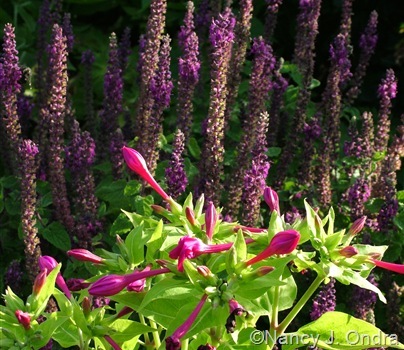 The teucrium is such a good-looking plant, you’d think it would be harder to grow. I don’t much mind the seedlings because the plants make great fillers. That’s a good question, Carolyn. I can’t imagine anyone planting L. purpureum as an ornamental; bees like the flowers, but otherwise, the plants aren’t all that interesting. When I had a shady garden, spotted deadnettle (L. maculatum) seeded around for me, and the seedlings usually weren’t as silvery as the parents; I wouldn’t have considered it an aggressive spreader, though. Maybe it’s more of a problem in other regions? Three very neat plants! I grew the Caucasian germander a couple summers back but it didn’t return the next year, and no seeds either. I’d definitely try it again, hoping it reseeds. And the Isla Gold tansy is so untansy-like in growth habits, nothing to fear in a dry zone 10 at least. I want great sweeps of it but it just slowly, slowly clumps up. The angelicas are so lovely that I trial them in containers now, tired of seeing them melt away in the garden. Only A. pachycarpa seems at home and has reseeded. I love seeing these plants flourishing in your garden. Poor Denise, with reverse zonal issues. Too much heat is seldom a problem here, except for gooseberries. 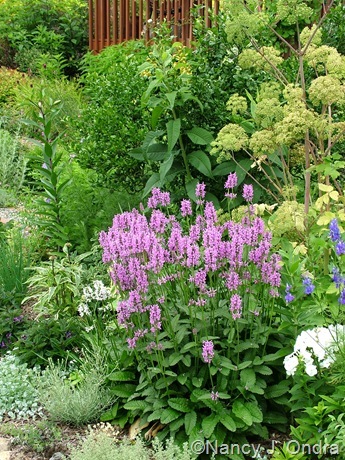 There are so many herbs I’d love to grow as perennials but have to sow them or buy new plants each year. It’s interesting to hear that tansy tolerates your Zone 10 conditions. I can easily imagine that it’s too much for most angelicas, though I understand that there are a few species that prefer 9, at least. To call tansy quite a spreader seems a substantial understatement. At least here in Massachusetts. It leapt out of my garden and into the adjacent field, and along my road. I’m glad that Isla Gold is more well behaved. The photographs are beautiful. Yep, I’m sure it can be a thug in the right conditions, Pat. 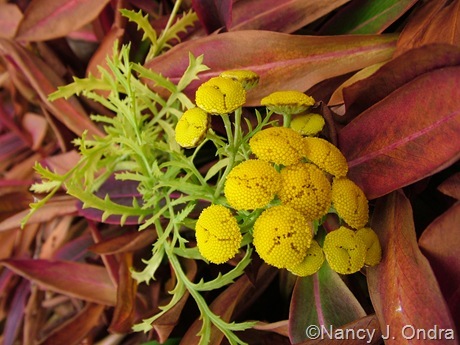 Since tansy clearly likes your garden, ‘Isla Gold’ might be too vigorous for you too. Welcome, Rhonda! I’m so pleased that you found these beauties of interest. I love purple spikes, so will try to get some of that germander. I already have lots of veronicas, salvias, delphiniums, stachys, etc. Now a new one to get, and according to the comments, should bloom longer than veronicas. You say that cutting back in Oct minimizes self-seeding – is it still pretty robust? 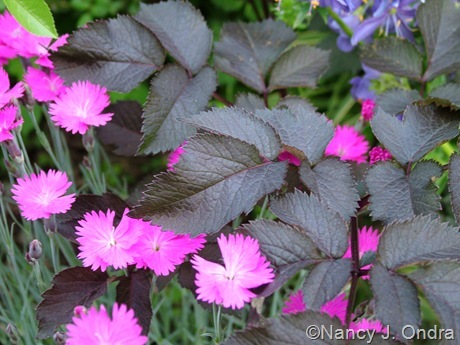 Self-seeding annuals are one thing, but self-seeding perennials can really get out of hand. I can’t give you a solid answer on that yet, Brenda, because I didn’t start the fall cut-back until 2009, and I’ve been moving the plants into new places while renovating their old areas. There did seem to be fewer seedlings last spring, but I won’t be able to do a real comparison until the plants have been growing in the same spots for a few years. I’ll leave some uncut this fall for comparison. To be extra-safe in your own garden, I’d recommend shearing the clumps back by about half in early to mid-August. You’ll probably get a bit of rebloom, but I’m guessing that the late spikes won’t have time to set seed in your climate. That will also likely improve the odds of the plants overwintering for you. 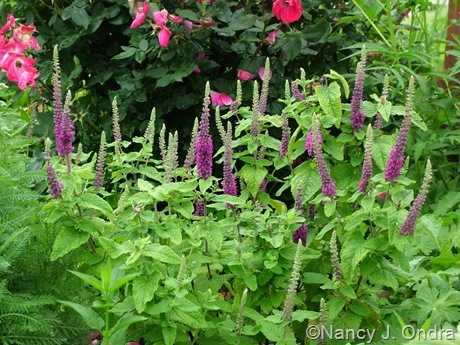 I find that woody-based mint-family members, like salvias and agastaches as well as wall germander, often don’t like being cut back in fall. I always look forward to these posts as a great resource to discover new plants (new to me, anyway!). I’ve coveted that Angelica for years, but can’t bring myself to sacrifice that much (horizontal) space in the garden for a plant that can be a bit “unreliable” ;-) I will content myself to admiring your pics for now…unless I ever get a larger property to garden on…then I’m all over it! I’ve been seeing Teucrinum pop up in magazines here and there and your posting was very timely…they pretty much exploit every weakness I have toward plants. Purple flowers-check, spires-check, long season of interest-check. I may have just found a new must-acquire plant for this season :-) BTW…after your previous post on Iris ‘Gerald Darby’, I was determined to order it online, but found a plant for sale at the Garden Show in PDX this weekend…score! That’s super, Scott! How great that you already got a ‘Gerald Darby’. 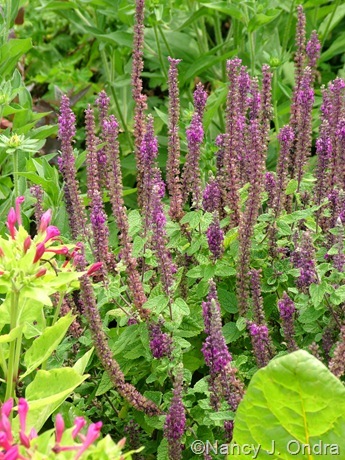 Now, for the teucrium, which does sound perfect for you – and much more space-effective than most angelicas. These are such beautiful combinations Nan. Gorgeous presentation with these photographs ! Glad you liked the selections, Joy! 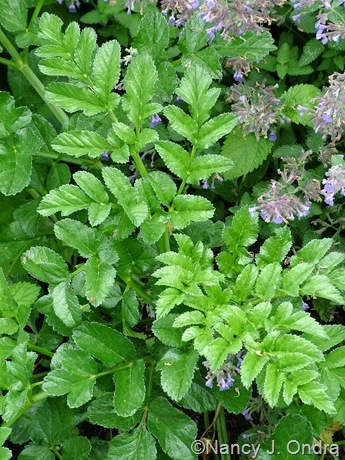 I hope you can find the tansy again locally; you’ll love it, I think. Good point about angelica being a high-impact plant like castor bean. 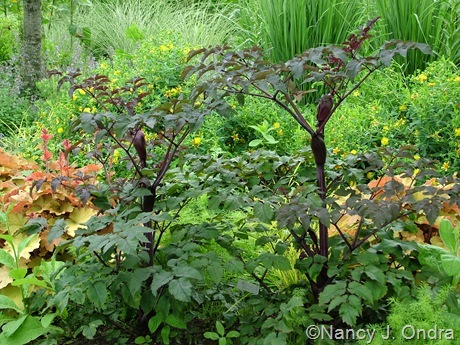 With the castor bean, though, you get predictable height every year. With angelica, it’s more of a spread for a year or two, and *then* height. 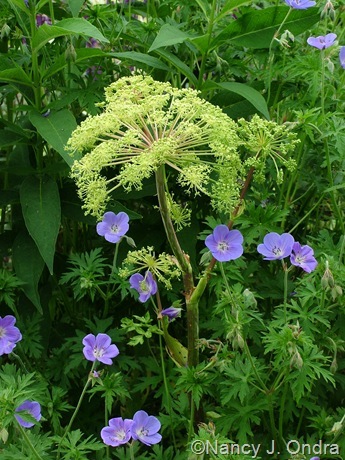 Still, the angelica is very striking in bloom, and it’s much safer to have around for folks who worry about the toxicity of castor beans around kids and pets. I loved this post! And wanted to let you know I featured it in my latest Top 5 Favorites. Blogging is new to me and I still haven’t mastered the use/understanding of trackbacks, so if you were already aware I mentioned you I apologize. Keep up the great work, I really enjoy reading Hayefield! Hi there, Laura, and thanks for the heads-up! I’m honored to make your list. I keep thinking I’m going to run out of neat plants to feature, but so far, so good – and now we’re starting a new growing season with new plants to try. I hope spring arrives soon for you too!